The organisation was established in Melbourne in 1987 and is non-denominational, politically neutral and non-aligned. It is constituted as a not-for-profit organisation managed by an elected Board of Management. Our work is funded by the Victorian and Commonwealth Governments, charitable organisations and donations from private individuals. Foundation House is a proud member of the Forum of Australian Services for Survivors of Torture and Trauma. 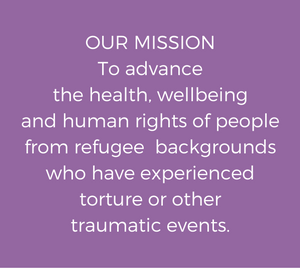 FASSTT is a network of Australia’s eight specialist rehabilitation agencies that work to reduce the impact of torture and trauma on individuals, families and communities.